Having focused on academic libraries last issue, we now turn our attention to public libraries. With a lot of attention on the immediate perils of closing public libraries, their long term future can easily be overlooked. Our lead article from Ken Chad refocuses the mind on the need for strategic direction. Councils up and down the land are using online services to take payments for a whole host of services. Academic libraries are using online services to take payments for fees and fines. Are public libraries missing a trick by not having online payments? 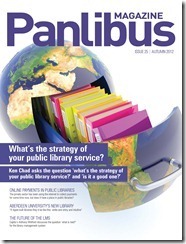 In this issue we take a look at the feasibility of public libraries extending their range of payment methods to include online. ‘What does the LMS look like in the future?’ is a question we are often asked. Capita’s head of product development, Anthony Whitford, gives an overview of where he sees the LMS heading and the technology being used to deliver it. We haven’t forgotten the academic librarians among our readers and hope you’ll find the article on the new library at Aberdeen University interesting. On opening the library, one of the students stated ‘if Apple built libraries they’d be like this: white and shiny and intuitive’. A fantastic quote and endorsement for all involved up at Aberdeen University. There is plenty more beside these features for you. We hope you enjoy this issue, and as always, encourage you to get in touch with your thoughts on any of the articles. If you have any topics you would like to write about, we would be extremely pleased to hear them. Please contact the editor at mark.travis@capita.co.uk.